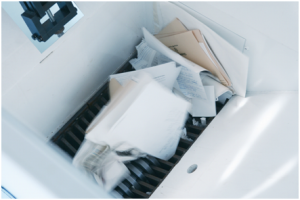 As the owner of a shredding company, I often get asked by prospects, “I know I need to shred sensitive documents, but why bother using a service, when I have my office shredding machine and it works just fine?” My reply, in three words: security and cost. Let’s look at security first. 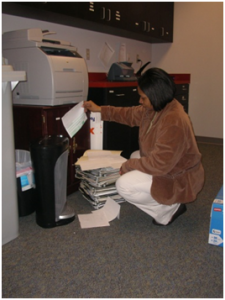 With an office shredding machine, one of your office staff, who likely has much better things to do, must take the time to pull out the staples, paper clips and binder clips from the documents prior to shredding. Then that staffer must feed the documents, three to ten sheets at a time, into the shredder. This is a painfully slow, mind-numbing process. If the job is of any size, there are two likely results. Result one is that the shredding machine jams or overheats. Result two is that the employee decides that he or she does not have enough time to do the job and leaves the documents to be shredded another day. In the meantime, the documents are exposed, most likely in a container that looks like the one in the picture at the right. Not very secure, right? If you’re a doctor, accountant, lawyer or other professional, would you want your clients seeing a box like that in your office? Keep in mind that most identity theft and corporate espionage still involves paper. Paper is easily transported and easily read. Moreover, most crimes of this type are inside jobs, meaning your own employees are the ones most likely to do the damage! 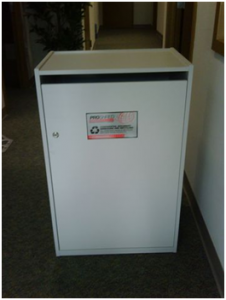 With a professional shredding service like Proshred, you will receive a secure, lockable collection container like the one below, often at no charge. The commonly-used console holds about 100 pounds of paper, which is equivalent to about four boxes of copy paper. Employees can deposit up to 400 sheets at a time through the slot in the top, and small fasteners need not be removed, which is a huge timesaver. Periodically, generally once per month, the shredding service will come to empty the console’s contents into a rolling bin that the shredding company uses to transport the documents to the shredding truck outside. At that point, a mechanical lift will pick up the rolling bin and tip it over into the shredder. You may observe the shredding via a video camera mounted on the side of the truck. You will receive a certificate of destruction from the shredding company following the shredding (does your office shredder give you that?). The shredded paper will be hauled away for recycling. Does this sound more secure than an in-house system? It should. Now, let’s address cost. 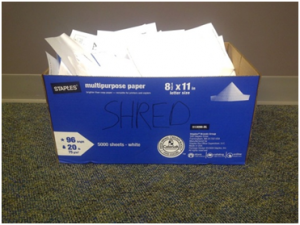 For the typical small office with 5-10 employees, you might expect to spend about one man-hour per week shredding paper. At $18 per man-hour for an administrative employee, that’s $936 per year in labor, time better spent on more productive tasks. In addition, a decent-quality paper shredder from Staples will set you back $150-$200, bringing the total bill to $1,100-$1,200 per year in shredding per year because the shredding machine usually breaks about once a year. With a service like Proshred, you can expect to pay $45 per visit for a single console (that’s lunch money for security). Over the course of a year, you will have 12-13 visits, or $540-$585. So, you will cut your expense in half while improving your document security and your staff morale! What should you look for in a shredding company? First of all, choose a company that will shred your documents on-site. Some companies will offer to save you money by hauling the paper away for off-site shredding. Don’t take that offer! These companies will sort through your paper by hand in order to separate the white paper from the colored paper, so as to maximize the value of the shredded paper to recycling companies. Do you really want that? Secondly, choose a company that is NAID-AAA certified. “NAID’ is the National Association for Information Destruction, our national trade association. 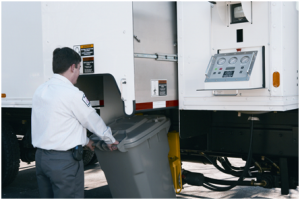 NAID-AAA certified shredding companies undergo rigorous audits to ensure their security and operations procedures are up to snuff, including having thoroughly screened staff and equipment that shreds material as finely as promised. Many large corporate and government clients insist on using NAID-AAA certified companies. You should too. Thirdly, choose a company that charges on a flat fee per container basis. Don’t choose a company that bills by the minute or the pound. If you do, you’ll be wondering every month what your bill will be, and you’ll be wondering whether your shredding company is running up the clock or putting their foot on the scale. Lastly, unless you are responsible for a large enterprise like a hospital, where a contract becomes necessary, choose a shredding company that won’t bind you to a long-term contract. At Proshred, we do not require long-term contracts except for very large clients. If we do not have a client’s trust, we should not have their business! Steve Theobald is General Manager of Proshred of Northern Virginia in Sterling, VA. You may reach him at steve.theobald@proshred.com. To learn more about Proshred, visit www.proshred.com.